Baby Belle’s body was found last Saturday morning on Bell’s Beach in Balbriggan. OVER A HUNDRED local people in Balbriggan held a candlelit vigil last night for a stillborn baby girl -named Belle by gardaí – whose body was found on a north Dublin beach last weekend. The newborn’s body was found at 10am on Saturday morning on Bell’s Beach in Balbriggan, by a woman who was cleaning the area. It is believed the body was wrapped in some cloth and had been left on the beach not long after it had been born. Be not afraid to seek medical help. We love you. Local Social Democrat representative Garrett Mullan told TheJournal.ie that everyone there last night was “overwhelmingly concerned” for the welfare of the mother. “It’s hard to get your head around what happened but no one is making any assumptions. 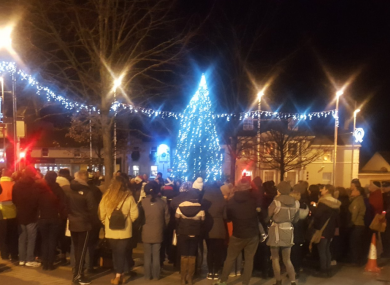 Email “Balbriggan locals 'united in grief' hold candlelit vigil for baby Belle ”. Feedback on “Balbriggan locals 'united in grief' hold candlelit vigil for baby Belle ”.